Fiction and non-fiction, cutting-edge and popular books; the one quality these works have in common is that they’ve attracted Thomas’ remarkably perceptive gaze and pen. This is a paean to reading by a thoroughly unjaded, committed amateur of the art, seriously appreciative of each book’s unique attributes. The works he selects are ones he admires: and he excels at conveying the excitement and respect they inspire in him. What a list he’s compiled: Jonathan Lethem, Jim Shepard, Rachel Kushner, Renata Adler, Georges Perec, David Graeber, Julian Assange, George Saunders, Hilton Als, Oliver Sacks, Cheryl Strayed, Dennis Cooper and Jennifer Egan are just a few of the authors whose work is here brilliantly distilled. Visual haikus closer to meditative poetry than traditional criticism, Thomas’ unforgettable, evocative drawings often manage to encapsulate the essence of a book far better than a 2,000 word essay in our leading journals. Take a look for yourself. Kevin Thomas was born in Southern California and grew up in the Pacific Northwest. Classically trained in music, he is self-taught in comics. 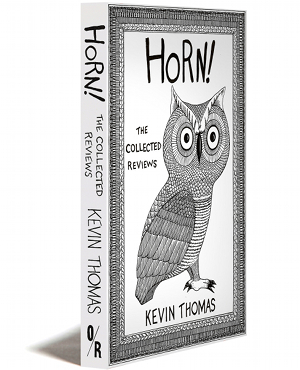 His comic strip Horn! Reviews appears fortnightly on The Rumpus. His work has appeared in Barrelhouse magazine and on OccupyWriters.com. He lives and reads in western Washington. Own an original Horn! Review by Kevin Thomas. Illustrations measure approximately 9.5 x 14″ on 11 x 17″ paper.